Review posted November 6, 2014. Scholastic Press, New York, 2014. 311 pages. Felicity Pickle collects words. She actually sees words rise off people and things, and she writes the best ones in her blue book. As the book starts, her nomadic mother is driving Felicity and her little sister, Frannie Jo, back to the town where she grew up. "Midnight Gulch used to be a secret place," Mama said. "The mountain hid the town high-up-away from the rest of the world. And the river surrounded the mountain and kept it safe. And the forest stood up tall around the river and caught all of the town's secrets and songs in its branches." I relaxed into the sound of her voice. Her speaking voice is wonderful, but my mama's story voice is like nothing I've ever heard, like something between a summer breeze and a lullaby. "The town had to stay secret, you see, because the people who lived there had magic in their veins." "Real magic?" I could barely even whisper the word. Just the thought of real magic sent shivers from my nose to my toes. This time it was my heart that answered, a steady drumbeat yes inside my chest. "That's the story they tell," Mama sighed. "They say some people could catch stars in Mason jars. And some people could sing up thunderstorms and some could dance up sunflowers. Some people could bake magic into a pie, make folks fall in love, or remember something good, or forget something bad. Some people had a magic for music. . . ."
"They could play a song and it would echo through the whole town, and everybody in town, no matter where they were, stood up and danced." She cleared her throat. "They say some people glowed in the dark. And some people faded when they were sad -- first they went colorless, then totally invisible. There are so many stories. . . ."
"And this magic town is the same town where you grew up?" I asked. "Then why the hayseed would you ever leave a place like that?" "All the magic was gone by the time I lived there. There was only a two-lane road and a traffic light that always stayed green. I figured that meant the magic had moved on out. Figured I had to move on, too, if I wanted to see any of it." Once in Midnight Gulch, staying with Aunt Cleo, Felicity learns about a family curse -- which might be why her Mama can't stop wandering. Felicity makes a best friend and gets to know people in town and doesn't want to leave. Her friend Jonah (who's in a wheelchair -- which is just his background, and hardly ever mentioned) urges her to do something that might break the curse. But Felicity stutters, and she's horribly afraid of speaking in front of people. Is she cursed to wander, too? Cursed to fail at everything she does? Normally, with fantasy books, I'm very picky about world-building and how the magic works. 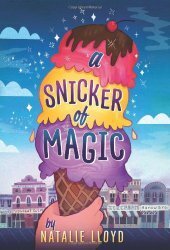 I didn't think I would like this book, because it's awfully loosey-goosey with the magic and I couldn't really believe in things like ice cream that doesn't need to be refrigerated (though that's supposedly science, not magic!) or shadows that dance. But this book was just so good-hearted, I couldn't help but love it. Felicity's a realistic kid, wounded by her past, but still beautifully hopeful. I like the way the words she sees aren't always actual words. For example right at the start she sees three smoke-colored words in the exhaust coming out of their car's tailpipe: Spunkter Sumpter Siffle-miffle. Words that hover around cars or trains or boats or planes never make much sense. At least they don't make much sense to me. I'm not sure if that's how it works for other people. I know I can't be the only word collector in the whole world, but I've never met anybody else who has the knack. I like the way she calls small, seemingly insignificant magic "a snicker of magic." I like her friendship with Jonah and Jonah's know-hows for doing people kindnesses. I especially liked some wise advice Felicity was given by her Mama (of all people) about memories. They're eating some ice cream with magic that makes people remember things. She asks her mother, "How do you make it do that? How do you keep getting good memories from it?" "It takes some practice." Mama set the carton back down on the floor. "But even if I taste something sour, even if the bad memory comes first, I choose to replace it with a good one instead." Mama nodded. "It's as simple and difficult as that. Sad memories don't just come in ice cream, you know. Everything you touch, everything you smell, everything you taste, every picture you see -- all of that has the potential to call up a sad memory. You can't choose what comes up first. But you can choose to replace it with something good. I choose to think on the good parts." So yes, I could focus my review on my quibbles about how the magic works. But you know what? The good parts really do outweigh them. This is a lovely book that uplifted my spirit.